Striking KQ engineers and technicians at a press conference in Nairobi on November 30, 2017. Striking technicians and engineers of national carrier Kenya Airways will move to court to protest their dismissal. The workers announced on Thursday they have engaged their lawyers over the matter. 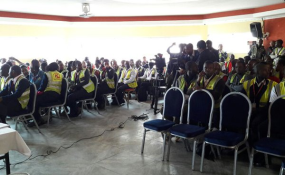 At a press conference, the more than 160 workers stated, through a seven-member committee, that they have resolved to take up the matter in court. "We will not negotiate again with the employer. The courts will now give the way forward on this matter," said Mr Joseph Oyuga, a certified engineer who spoke on their behalf. The workers, who include technical assistants, technicians and engineers, have boycotted work since Tuesday evening to demand higher salaries. They want their pay to match those of their counterparts in Middle East countries. Mr Oyuga also raised serious concerns over the safety of aircrafts and passengers, saying normal but critical maintenance procedures could be affected. The committee member said those currently supervising and signing off aircrafts are not properly qualified to do so. "Some of them are our managers who last undertook such technical procedures a long time ago. As of now, the safety of those planes and the passengers cannot be guaranteed," he said. The workers, who vowed to continue with the strike until their demands are addressed, demanded an audit of the work done since the boycott began. This should be done by the Kenya Civil Aviation Authority, they said. Mr Shem Onyango, another engineer and a member of the committee selected to represent the staff, lamented that their employer, KQ, has been unwilling to meet them and discuss the concerns they have raised. KQ boss Sebastian Mikosz told the striking employees that the boycott was against the company's efforts at financial restructuring. He said the airline will not be held at ransom by striking workers. KQ, which is financially constrained, said a technical assistant used to earn Sh120,000 and this was increased to Sh200,000 in April after a review; but add that the workers are now demanding Sh340,000. Production and duty control engineers, who earn Sh340,000 want a pay hike to Sh1.2 million a month, the national carrier said. But Mr Oyuga said a technical assistant currently earns Sh36,000. He said the want the salaries of technicians increased from Sh62,000 to Sh500,000 and that of senior technicians increased from Sh90,000 to Sh600,000. Mr Oyuga added that engineers' salaries should be increased from Sh200,000 to Sh720,000.